I loved how very different this story was. Yes it is very dark and detailed but the victims were only seen as the frames for the beauty that they held, the unique tattoos. The story is told through a number of characters, Marni a tattoo artist herself who found the first victim, D.I. Francis Sullivan who heads the case, Rory who works with Sullivan and the killer. The story dips back and forth in the killer’s mind to the past and never quite being good enough and so now there is so much to prove. I do have to say that although gruesome there was a perverted love and skill in what the killer did. It really made the goose bumps dance on my arms especially when I think of all the tattoos that my children have! As the story unfolds the killer is clearly in plain sight enjoying the grief caused by their actions. What helps the killer even more is how disjointed the investigating team are. Sullivan’s boss is a by the book bloke, with Rory more bothered about his pension that leaves Sullivan to take the risks. Love how the clues throw him and Marni together constantly. Marni herself has a very colourful past which I hope will come to light in more detail further into this series. A brilliant character that is easy to like especial as her fiery ex-husband keeps things lively. This is a thrilling read which totally threw me off who was behind it all. A brilliant debut by this author. A superb plot and very engaging characters. Alison Belsham initially started writing with the ambition of becoming a screenwriter-and in 2000 was commended for her visual storytelling in the Orange Prize for Screenwriting. In 2001 she was shortlisted in a BBC Drama Writer competition. Life and children intervened but, switching to fiction, in 2009 her novel Domino was selected for the prestigious Adventures in Fiction mentoring scheme. In 2016 she pitched her first crime novel, The Tattoo Thief, at the Pitch Perfect event at the Bloody Scotland Crime Writing Festival and was judged the winner. 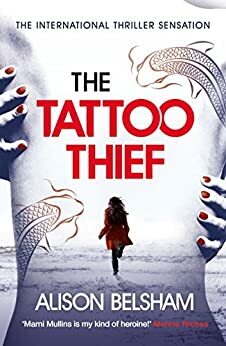 After signing with agent Jenny Brown, The Tattoo Thief was bought by Trapeze books and published in May, 2018.